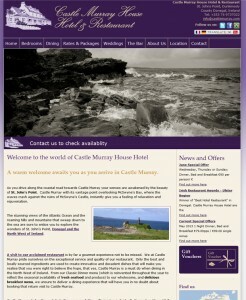 Why not enjoy a night or weekend at the award winning Castle Murray House & Restaurant in St. Johns Point, Dunkineely, Donegal. As you drive along the coastal road towards Castle Murray your senses are awakened by the beauty of St. John’s Point. Castle Murray with its vantage point overlooking McSwyne’s Bay, where the waves crash against the ruins of McSwyne’s Castle, instantly give you a feeling of relaxation and rejuvenation.